This is the second in the series about how Mom's are dealing with the Foundations to Challenge years for Classical Conversations®. This next family has children in both stages (and beyond!). They also have children in private, as well as homeschool settings. The reality is that they have 10 children over 25 years of marriage! So read along with me as I interview Rebecca Jacobsen, Mom, Tutor, Wife and fellow Blogger! Can you tell us a little about your family and children? We are a Christian family of twelve! We have ten children with ages ranging from 3-23 years. We have been homeschooling for almost 18 years now. My husband and I met at a Christian college and have been married 25 years this summer. What programs are your children enrolled in (both CC and public or private schools) and how long have you been doing Classical Conversations? Currently I have four children in the Foundations program, one is in the Challenge program and two are in preschool. I also have a high school aged son at Cary Christian School, which is a local Classical Christian school in our area. My older three have all graduated high school. Two are now in college and one is in the military serving. My biggest driving factor is following the Lord’s leading. I began homeschooling when my oldest was beginning kindergarten when I felt like the Lord spoke to me to do so. I only thought I would homeschool for one year! Each year we pray about what is best for our children and seek God. My children that have gone into a classical Christian school have done so because they wanted to do sports, in addition there were certain academic subjects that they were interested in that wasn't offered through Classical Conversations® and driving multiple children to multiple locations to take individual classes isn't an option in a family my size. My own personal reasons are that I like to allow my children to have access to a wider social environment while they are under my roof before they go off to College. I have realized over the years, how fast children grow and that you really don’t have that much time with them. I love how homeschooling lets me spend more time with them and they also get to spend more time with their siblings. Having the Foundations base is a huge help when you enroll a child in Challenge, but it is not absolutely necessary. I enrolled my fourth child in Challenge B when we discovered the program. He had been homeschooled all his life but had not had Foundations. My son is in Challenge A currently, and I can clearly see that having at least a few years of Foundations, especially Latin, has helped him greatly. While it's doable to enter Challenge without any Foundations experience, it is certainly easier for them, if they have gone through Foundations beforehand. My style of homeschooling has been a natural fit for Challenge. I feel that by middle school, children should be pretty independent with their school work. This has been a great preparation for my Challenge children. Since I am busy with my younger ones, that means that my older kids need to become independent with their school work at a young age. That is a big part of Challenge - learning to be independent and own their education. So my push for independence is helpful preparation for them moving into Challenge, since they already understand how to manage their own work pretty well. I do still help my Challenge student do his schedule for the week and then help him when he needs it - but otherwise, he is able to manage his work independently. I go over his math with him each day and edit his papers, but that is about all at this point. What from the Foundations program have you found to be most beneficial to your Challenge children? Mostly the Latin and Geography instruction and the ability to memorize, have been the most beneficial to my children moving into Challenge. Also doing presentations each week in class during Foundations, is good preparation for Challenge - really it's great preparation for any high school or college classes. What is the most difficult part of Challenge for you as a parent? With younger children, I am not able to attend the Challenge class much at all. So I would say the most difficult part for me, is not knowing what is going on sometimes and then having to help him at home. Also, no program is perfect, so there are times that I don’t like what they are learning or the pace the instructor is teaching. As the parent though, I just tweak things. What is the most difficult part of Challenge for your child(ren) (and for each learner it may be different)? My two boys that have done Challenge have probably struggled the most with Latin and Composition. What do you find to be the most beneficial part of Challenge for your child? The class room setting and the accountability are really important to me for my children. Also it is great how the subjects are all connected to each other, which helps them see the bigger picture and put things together nicely. Overall, Challenge is an awesome program and the Foundations program feeds perfectly into it. Foundations provides preparation for Challenge that makes it so much easier and well prepared to tackle the higher levels of education. I would give any family the advice of praying about what God would have them to do. I would be flexible, realizing that it may be different for each of your children. I think it's helpful to talk to your child and get their input as well. I would also suggest visiting a Challenge class and seeing if it’s a good fit for your family and child. I so appreciated this interview. Having a child in Challenge A this year (with no previous CC experience) has really been a journey, and I can see how it all fits together since I also have one in Foundations at the same time. There's a lot of wisdom in this interview. Thank you for sharing it! What a beautiful family! I love that you are not trying to fit all your children into the same mold! 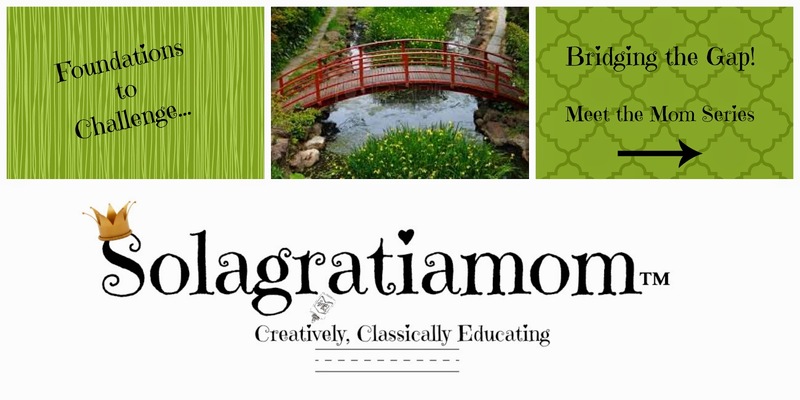 Thanks for sharing your insight into a Classical education! I'm beginning to feel as if we need a little more structure in our homeschool!